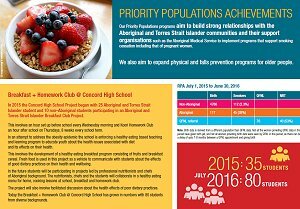 The Health Promotion Unit develops, implements and evaluates community-based programs that improve and maintain population health and reduce inequalities in health outcomes. 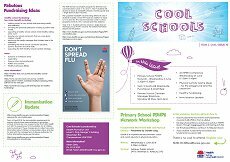 Health has multiple dimensions, encompassing physical, mental and spiritual aspects, and, as mentioned above, multiple determinants including socio-economic and environmental factors which are often outside the immediate control of individuals. 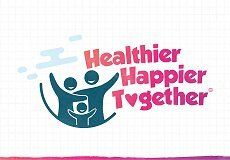 Health gain therefore cannot be achieved by the Health Promotion Unit working alone. 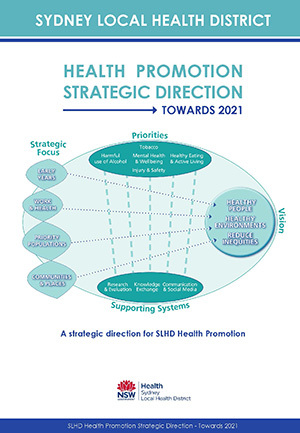 By working in partnership, the Health Promotion Unit will continue to deliver evidence - based and evidence building health promotion programs with the communities of SLHD.